Our production differs from others of a kind. It underlays on Mendziņu family bread baking traditions, wich has more than 80 years old history. Bakery ”Liepkalni” has inherited these valuable traditions and keeps to improve and apply them succesfully. Bread baking has been usual activity in every farm-stead, not ecxeptional also in Liepkalni farm, where in former times thorough worker named Jānis Mendziņš had been managing a household. 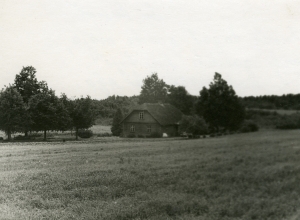 He owned this great, well-cultivated farm ”Liepkalni”, established in year of 1928. Fields were sowed with rye and wheat, and the house were surrounded by lime-trees. It was a really beautiful farm, indeed. In autumns harvesting took place and all the golden grains were delivered to mill for grinding: rye corns - for baking a black bread, wheat corns for white bread and flat cakes. On Sundays farmer’s wife prepared a dough in wooden hod, fixed a fire in big stove and put big, rounded bread loafs into it. Soon the delicious smell was all around in the air. Farmer Jānis always showed a dignity for bread and contributed work by kissing the first slice of freshly baked bread. Farmer’s wife had her masterstrokes and over the years collected recipes wich provided the soft structure and substantial taste of her bread. Often bread was enriched with home-grown linen seeds, pumpkin seeds and caraway-seeds. Farmer Mendziņš sheltered and kept the unique aura of his farm-stead until 1970. He was a mentor and inspiration for other farm-keepers. The time went by, social systems changed and collective farms destroyed farm ”Liepkalni” as well as other farms. The soil and country-sides kept it’s nature power, waiting for right time and good hands. 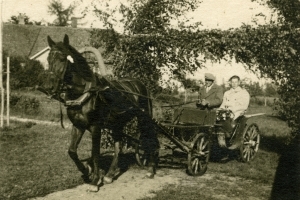 It was the beggining of 90.-ties when Dagnis, a grand-soon of farmer Mendziņš, retrieved back the land of ”Liepkalni”, however the farm-stead no longer existed. The only thing lef on the land were piles of rocks, loaded up by grandfather as the boundary-marks. Dagnis felt very deep belonging to his ancestors and set-up a goal to sustain family roots. He showed dignity to inherited land and soon the intensity of dream to grow a harvest there allowed it to come true. In 1993, when the first rye and wheat harvest were threshed out, new farmer took up baking bread for his family and surrounding districts. He did all the work himself- prepared a dough, formed a loafs and baked delicious and substantial bread. First batch had to be strong and solid, therefore rye-flour was used and black-bread were backed- the most latvian and substantial, produced only here, in Latvia. In process of baking, Dagnis used all the masterstrokes left in his grandmother notes. Recipes were improved and supplemented in the course of time. This story of bread kept rolling in city Rūjiena, when they started to bake in portable country style bread stove, heated with real wood. This stove is now exposed in the recent production unit of Liepkalni – located in Klintaine by river Daugava. In baking there were used grain grown only in the land of Liepkalni farm, but when the production expanded collaboration with local agriculturists were established. Traditions are still being taken into consideration and bread is beeing baked only from localy cultivated rye grains in four bakeries located in following cities – Rūjiena, Valmiera and Klintaine district. In spring of this year Liepkalni opened one more production unit in Kocēni district, located in Valmiera region, in order to reach customers from Valmiera and such faraway regions as Cēsis, Sigulda, Limbaži and Rīga. The opening of this production unit enabled producing of brown bread products. In spring of 2003 operations starts advanced, up to the EU standarts, production unit in Valmiera, Vidzeme region. In accordance with legislation, wich provides the procedure of food producing enterprise development, ”Liepkalni”Ltd. Valmiera production unit placed remarkable capital investments, arranged internal environment, became one of the first producing units who were accredited by The Food and Veterinary service and also implemented EU Quality Management ISO and HACCP standarts (Standarts of health safety criteria of food products). At the beginning of the year new and modern production unit were established in ”Liepsalas”, Aizkraukle region, Klintaine district.